Blue chalk circles are being drawn around random objects. A pigeon’s foot, a cigarette lighter etc and the media is rife with theories as to what they mean. Are the circles drawn around the objects or are the objects placed in the circles. Serious stuff, eh? 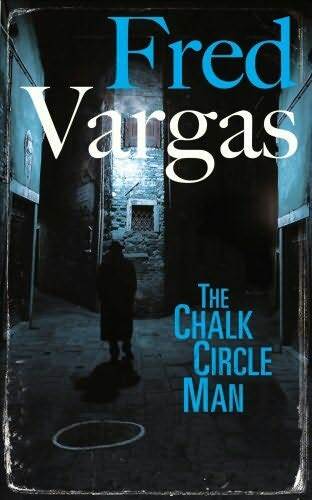 Only Adamsberg, the new detective in Paris, believes the circles to be sinister and fears the worst. Adamsberg solves crimes by intuition and when the first body appears in the circle his worst fears are realized. The Chalk Circle Man is filled with large characters. His Inspector Danglard, a single parent who enjoys his afternoon drink of wine, likes to collect information and looks for logic to solve the crime. Adamsberg’s method of crime solving drives him crazy. Mathilde the oceanographer who fills her apartment with sad lodgers. Charles Reyer the blind man, and Clemence, the lonely hearts spinster add color to this wonderful crime novel. Each of the eccentricities of the characters help Adamsberg solve the crime. It is a charming book, the first in the series and I am eager to read more. Two powerful business men have been murdered and Swedish powers fear a serial killer is on the loose. A task force is put together because powerful dead men deserve a powerful new task force. The Swedish A team, yes it is the A Team, are a mismatched team recruited from all over Sweden for their varied talents I guess, but none of them specialists in their field. Each of the team have issues and back stories that flit in and out of the story, but only superficially as the main copper is Hjelm and most of the book is about him. Hjelm when we stroll into his life is about to be kicked off the force for showing racist tendencies. During a hostage situation involving an Albanian protesting against his deportation order, Hjelm wades in with his gun and shoots the man. Hjelm claims he saved the man’s life, the media hail Hjelm as a hero but his superiors believe his actions to be racially motivated. So an offer to join the A Team is unexpected to Hjelm and the reader. We are led on a merry dance as the A Team chase down false leads and place themselves in front of many bullets without back up, until the killer makes a mistake. Oh yes. He has a habit to go with his killing and an unexpected intruder causes him to panic and leave the clue that leads the team to a man with a serious grudge against all powerful bankers. I loved Hjelm and felt sympathy with his hard luck story but the other characters of the A Team struggle to jump out of the pages. I like the ending and enjoyed the tale, but it did lack some balls and seemed a little clichéd.